Winemaking depends on a complex group of microorganisms such as yeasts, bacteria, and fungi, which colonize grapes, must and wine. Understanding their wine-relevant activities is essential to improving the selection and management of novel starter cultures and consequently wine quality. "This compilation is outstanding. contributors from eight countries offer recent information on the microbiology of wine production, covering specific topics in both breadth and depth. The text contains detailed tabular information and clear, readily understood figures. … This is excellent scientific reporting." This is the only book to explain the complexities of the science and technology of wine in simple terms, and therefore fills a gap in the large market of wine information by making wine's technical mysteries accessible to those with no scientific education. From the author of the acclaimed Angels’ Visits comes an inside look at how a handful of ingenious winemakers has transformed - and been transformed by - the California wine industry over the past four decades. Want to learn about wine, but don't know where to start? Wine All-In-One For Dummies provides comprehensive information about the basics of wine in one easy to understand volume. In winemaking, what is the fermentation process, and why is it so important? The fermentation process turns grape juice (must) into wine. This is a complex chemical reaction whereby the yeast interacts with the sugars (glucose and fructose) in the must, to create ethanol and carbon dioxide. The CO2 is released from the wine vessel through a fermentation lock. The importance of fermentation temperature. During the process, the temperature and speed of fermentation are vital considerations, as are oxygen levels in the must prior to the start of the ferment. Heat is created during fermentation which raises the temperature of the fermenting must as the yeast gets to work. When temperatures approach 104°F (40°C), the activity slows down and yeast cells start to die. If temperatures remain high and the yeast stop reproducing then the fermentation is at serious risk of becoming stuck. Even if the must is cooled down, the fermentation will be very difficult to restart. Modern winemaking equipment includes temperature control devices such as stainless steel fermenting tanks with internal or external cooling units to help regulate temperatures. Controlling fermentation temperature - especially in hotter countries - has become one of the most vital areas during winemaking, as the speed and duration will have a huge impact on the final flavor and character of the wine. In colder wine growing areas, 'cool fermentation' is de rigueur nowadays, that's why so many attractive white wines with loads of flavor and zing are being produced from higher altitudes all round the world. Once the grapes have been pressed and the acidity and sugar levels have been checked and adjusted as necessary, it is time to prepare the must for fermentation. Yeast Nutrient: add at the rate of 1 teaspoon per gallon. This is not yeast, but an energy source for the yeast which will be added later. Pectic Enzyme: add at the rate of 1/8 teaspoon per gallon. This is used to aid in the clarification of the wine, and in the case of red wines, to help break down the pulp so more flavor can be extracted. Potassium Bisulfite: add at the rate of 1/16 teaspoon per gallon or 1/4 teaspoon for every 4 gallons. This is used to sterilize the must, to kill all the wild molds, bacteria and yeast that come with the fresh grapes. Over a 24 hour period the Potassium Bisulfite will sterilize the juice and then dissipate into the air. Only cover the fermentation vessel with a light towel during the waiting period. Yeast can then be added after waiting 24 hours. If the yeast is added before the Potassium Bisulfite leaves, it will kill the yeast as well. Just sprinkle the yeast onto the surface of the must at a rate of 1 package for every 5 gallons. It is important that during the 24 hour waiting period before the yeast is added that the fermentation vessel is only covered with a light towel, maybe an old t-shirt. This is to make sure that the Potassium Bisulfite which needs to escape and leave the vessel is not trapped by a lid or a heavy covering of some kind. Once the fermentation gets under way, try to ensure that the temperature is cool and stable. TOO HOT: YEAST MAY OVERHEAT, AND DIE QUICKLY. TOO COLD: MAY END UP WITH A STUCK FERMENTATION. What is a stuck fermentation? A stuck fermentation is one where the yeast has become dormant before all the available sugar in the wine has been converted to alcohol and CO2. This usually occurs when conditions aren't ideal for the ferment to take place, so if you gave up on the wine at this stage, it would taste fairly sweet, listless and lacking in character. It is difficult to restart as the dying yeast cells release a chemical compound that inhibits future growth of yeast cells in that particular batch. It is important to try and get the ferment back on track again as soon as possible. Fortunately stuck ferments don't occur that often, nevertheless, be prepared and be vigilant! How do you know if it really is stuck? Has the fermentation been taking place under warm to hot conditions? If so, then your wine may well have fully fermented out without you realizing. As yeast works faster in warmer situations, it is possible for a ferment to complete within a few days. Is your airlock well sealed in the vessel, and undamaged? This seems an odd question, but I have come across many airlocks with fine cracks in them which offer a hidden CO2 exit point. Also an airlock can become unseated from the neck of the vessel during a rapid part of the ferment which you wouldn't notice - so check that it is pushed in tightly. What to do to avoid the problem in the first place. Ensure pesticide residue on the outside of the grapes. Wash and clean thoroughly before processing. Use yeast with a high temperature and alcohol tolerance. Ensure that all equipment and utensils are sterilized to reduce the chance of picking up wild yeasts or bacteria. Don't use out-of-date or improperly stored yeasts. Rehydrate yeast correctly as per manufacturers instructions and at correct temperature. Avoid overdosing with sulfites (sulfur dioxide solutions, metabisulfate or Campden tablets). If levels are too high yeast will be unable to reproduce. Add nitrogen to the must in the form of diammonium phosphate, this nutrient will help in feeding the yeast. Nitrogen deficient musts derived from grapes grown in vineyards with soils lacking in nitrogen is a common cause. Avoid producing over-ripe grapes in the vineyard or backyard as these will have high sugar levels which means a higher alcohol content. Yeast can't multiply in an environment with 16-18% abv (alcohol by volume). A by product of the energy created during fermentation is heat which raises the temperature of the fermenting must as the yeast work. When temperatures near 104°F (40°C), activity slows and yeast start to die. If temperatures stay high and the yeast stop reproducing then the fermentation is at grave risk of getting stuck. Even if the must is cooled back down, fermentation will be very difficult to restart due to a chemical compound released by the dying yeast that serves as an inhibitor to the growth of future yeast cells in the batch. 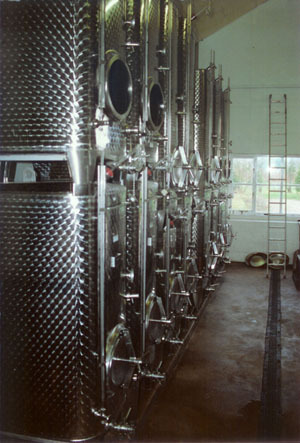 Modern winemaking equipment includes temperature control mechanisms such as stainless steel fermenting tanks with a cooling jacket to help regulate temperatures. Adjust the temperature of your wine. In many cases warming the wine to 70-75°F for a couple of days will get the ferment going again. Rouse the yeast by stirring the lees - occasionally by agitating the yeast around in the wine will get the fermentation on its way. Remove the old yeast by racking the wine, and prepare for a new start by re-inoculating with a new batch of yeast, preferably a killer strain like Lalvin EC-1118. WARNING: Don't add vitamins (yeast nutrient) during stuck fermentations. Leftover vitamins can stimulate spoilage microbes. Only add a yeast nutrient before or as you add your yeast. If you want to add a yeast energizer at this point (which is not the same thing as yeast nutrient), do so. This can be obtained from your local drug store [just ask the pharmacist for some Thiamin HCL - thiamin hydrochloride). Add 25 mg per gallon of wine and mix thoroughly. If you detect there is a nitrogen deficiency (less than 200 mg/l fermentable nitrogen), it is necessary to add DAP (diammonium phosphate). What is a stopped ferment? he wants some sweetness to remain in the wine to help balance it with the acidity. after tasting, the wines' character will be accentuated by ceasing the ferment sooner rather than later, before all signs of sugar have been turned into alcohol. if the wine is fully fermented out it will appear to be too 'big' and powerful (i.e. have too much alcohol for the required style). Stopping a ferment is not always successful, especially if you want more sugar to remain in the wine. Naturally, the yeast wants to continue consuming the sugar, so it is vital to get rid of the yeast cells as soon as possible, by racking and possibly filtration. This may not suffice on its own without an addition of SO2 - but be wary not to overdose the wine with high sulfur levels just to try and kill off the yeast cells. What can sometimes be necessary is a complete filtration through to a sterile stage, and an earlier bottling - to capture the character. Differences between fermenting red wine and white wine. There is a big difference in the way a red wine is fermented compared to a white wine. This is because of the necessary color extraction from the grape skin contact with the must for a red wine, whereas whites, on the whole, don't require any contact with skins, stalks or pips. When fermenting a must for a white wine (must can come from red or white grapes), it is desirable to separate the grapes from their stalks prior to pressing, so that excessive contact can be minimized to reduce unwanted tannins. Speed is of the essence, from picking the grapes to getting the must into a vessel out of air contact as quickly as possible. It is normal to add a small amount of sulfite to the must after pressing, to minimize oxidation prior to preparing the must with yeast for fermentation a day or two later. The conclusion for whites is immediate exclusion of oxygen contact after pressing, unlike for reds. Fermenting reds are generally easier as air contact elimination is not as vital. Why, I hear you say? Well, after the red grapes are picked, the main task pre ferment is to remove all the stalks, so that one is left with just berries and juice. A destalking machine is used in commercial situations, where a fork might suffice if you only have a few dozen bunches to do at home! After the grapes have been destalked (the process also breaks the berries to release the juice), they are put into an open-topped container that can be temporarily covered. Any sugar adjustments are made at this stage before the yeast is gently plunged into the heart of the sample and left to react. Once the ferment starts, the solid matter, i.e. the grape skins and pips are pushed to the top by the reaction leaving the must underneath. For decent color extraction, the skins must be pushed down daily, or more if you are looking for more intense color. This pushing down is called 'maceration'. After a week or two the ferment will subside and end, it is now that the grape skins and must will be pressed with the must being stored either in a standard fermenting vessel or into an oak barrel where it can, if required, go through a malolactic fermentation. The conclusion for reds is to ferment on the skins to gain color and a certain amount of tannin, with the issue of air contact not being as important as with whites. 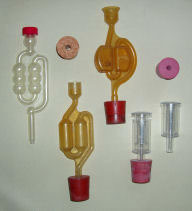 For home winemaking, here is a typical selection of air locks for your demijohn or carboy mostly with rubber bungs for a good seal. As the bodies are usually plastic, check that there are no cracks in them for either the water to drain from or the air to enter. During the fermentation, especially at the initial faster stage, it may be necessary to clean the units on a daily basis as fermenting wine and vinegar flies often become clogged in the bulb areas. 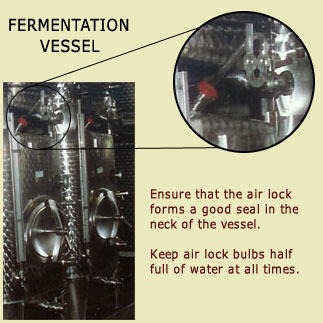 If one is not paying attention, when the ferment slows down, the air lock can be found to have little or no water in it - so leaving the wine open to the air. These can be obtained from the Store here or a good home wine or brew shop.